Join CRCA's 1st Annual Membership Appreciation Casino Night! 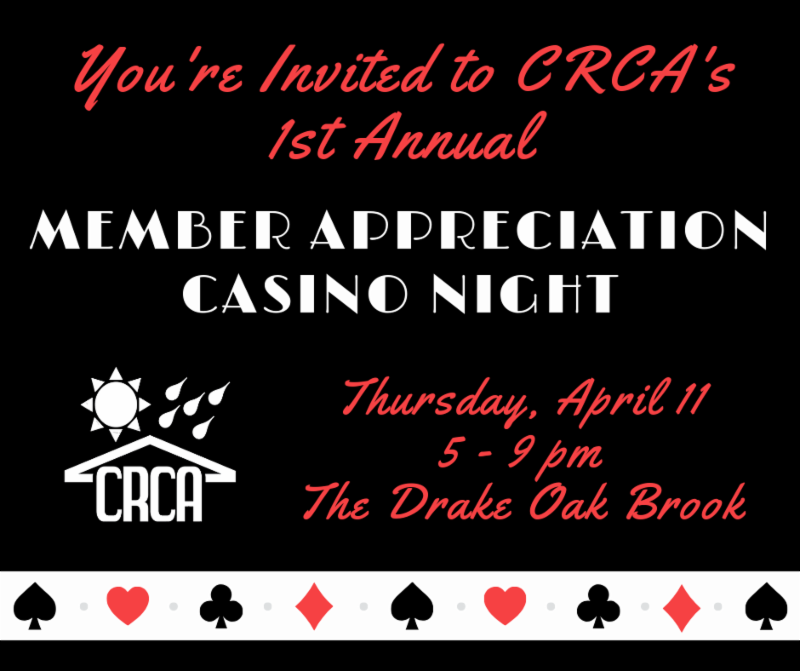 As a thank you for your support, CRCA would like all of our members to join us for a complimentary night of cocktails, appetizers, casino games and fabulous prizes! Each event attendee will receive $500 worth of poker chips to play various table games like craps, blackjack and more. Attendees can also earn bonus chips in a variety of ways, such as: speaking to a CRCA Committee Chair or Board Member, donating to the CRCA Foundation, or bringing a potential new CRCA Member. At the end of the night attendees will cash in their chips for raffle tickets to win great prizes! Anyone who is an employee of a CRCA Contractor, Associate or Roof Consultant Member Company. Potential new CRCA Members may come as guest of CRCA Members. Please note that pre-registration is required for this event. Anyone who does not cancel by April 5th will be charged a $45 no-show fee.